Winner of the Women’s Singles title last September in the northern Colombian city of Cartagena de Indias at the 2017 Pan American Championships; on Sunday 15th July, Puerto Rico’s Adriana Diaz completed the double in Santo Domingo, Dominican Republic. She won the Girls’ Singles title at the 2018 Pan American Junior Championships and thus prevented a United States clean sweep; soon after, Kanak Jha claimed the Boys’ Singles crown and in so doing secured the title for a third consecutive year. However, Adriana Diaz came perilously close to defeat; she prevented the United States gaining a full house of titles by the very narrowest of margins. The no.2 seed, at the final hurdle she faced Amy Wang of the United States, the top seed; a seventh game was needed to determine the outcome. Amy Wang made the better start in the decider, she led 4-1, then 8-4 and 9-6; Adriana Diaz levelled at 9-all but lost the next point. She saved the match point before eventually clinching victory on her second match point (9-11, 11-8, 11-9, 10-12, 11-5, 7-11, 13-11). Success and success for the second time, also to some extent, the victory laid to rest the gremlins of one year ago. In the inaugural tournament in 2016 in Burnaby, Canada, Adriana Diaz had emerged victorious; last year in Buenos Aires she experienced a nightmare. In the final she led 10-4 in the seventh game against Brazil’s Bruna Takahashi, only to lose the next eight points and have to settle for runners up spot. In Santo Domingo, it was the bronze medal for Bruna Takahashi as it was for Crystal Wang, also from the United States; at the semi-final stage Bruna Takahashi, the no.3 seed, was beaten by Amy Wang (11-9, 5-11, 11-9, 6-11, 11-2, 5-11, 11-6); Crystal Wang, the no.14 seed, experience defeat at the hands of Adriana Diaz (11-4, 8-11, 11-7, 11-3, 11-9). Tense times in the Girls’ Singles concluding stages, in the counterpart Boys’ Singles event, as in the previous two years, Kanak Jha stamped his authority on proceedings. 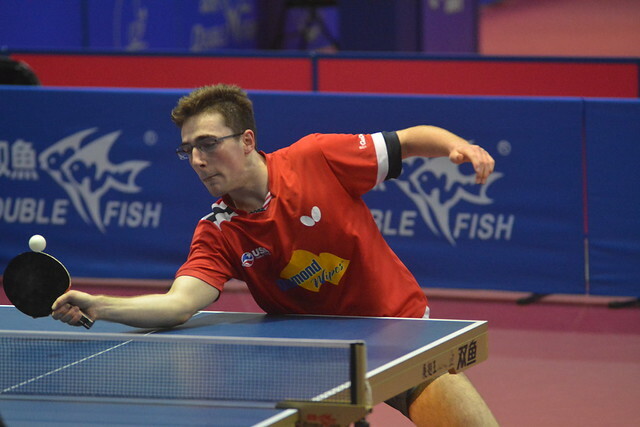 At the final hurdle, the top seed, he beat United States compatriot, Sharon Alguetti, the no.2 seed (11-7, 11-7, 12-10, 11-6) to secure the title, having one round earlier accounted for Chile’s Nicolas Burgos, the no.3 seed (11-8, 11-6, 11-9, 11-8). In the counterpart semi-final, Sharon Alguetti had accounted for Brazil’s Guilherme Teodoro, the no.4 seed (11-7, 13-11, 11-2, 9-11, 8-11, 11-9). 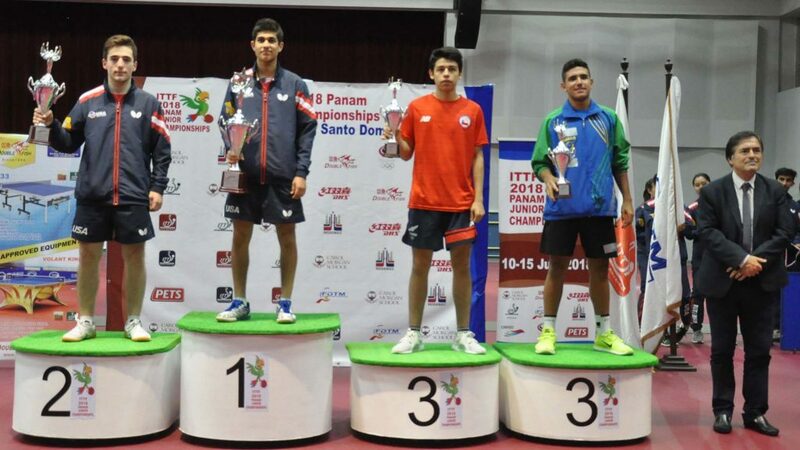 The result meant that Kanak Jha and Sharon Alguetti departed Santo Domingo with three gold and one silver medal against each of their names. Earlier in the tournament, they had been members of the successful outfit in the Boys’ Team event and had joined forces to secure Boys’ Doubles gold; in the Mixed Doubles event, Sharon Alguetti had partnered Crystal Wang to victory in the final against Kanak Jha and Amy Wang. A most successful visit south; the United States had made their presence felt, Adriana Diaz stood alone.